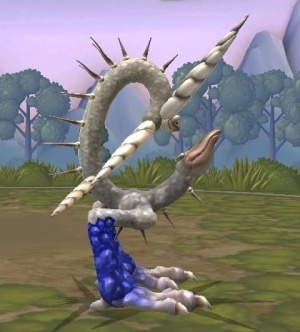 Spore aims to deliver the ultimate god game, giving the player the means to control and evolve life from primitive cellular organisms into sophisticated, intergalactic societies. Hence its original working title: Sim Everything. Spore has some pretty big shoes to fill. Though it may not carry the Sim name, it'll be the latest in a long line of ridiculously profitable games sprouted from the fertile soil of Will Wright's imagination. The Sim brand spans nearly two decades, and demonstrates Wright's fascination with creating and controlling worlds on multiple scales. Sim City let players try their hand at managing (or mismanaging) urban environments. Sim Earth expanded the series' realm of influence to planetary proportions, while Sim Ant reduced it to a single suburban backyard. And in 2000, the franchise produced what was to become the most powerful franchise in PC gaming history: a humble household simulation called The Sims. The Sims and The Sims 2, together with their fifteen total expansions, five editions, and nine "stuff packs," have been top sellers since the series first hit retail. Scan any retail PC game sales chart, and you'll inevitably find various The Sims incarnations taking up several top slots. Last April, Electronic Arts announced the franchise had sold more than 100 million units. Can Spore, which aims to incorporate the settings explored by nearly every prior Sims game, follow suit? It's a tall order, especially for a game that boldly sets aside the brand name of its predecessors. "Spore" certainly lacks the epic ring and brand recognition of "Sim Everything." Instead, it evokes a sort of science fiction geekiness that, admittedly, appears to fit the game perfectly. Earlier Sim titles catered to a strategy-minded crowd, but The Sims found massive success by tapping a much wider market. Its cheery suburban melodramas and charming consumerism hit home with PC owners of all ages and genders. Everyone with a computer (which by 2000, was almost everyone) was a potential player. Spore, in contrast, is just plain weird. It's all malformed limbs, tentacles and googly eyes. Quirky creature societies and incomprehensible alien cities. Retro flying saucers and oddball planets. It initially comes off as cartoonishly bizarre mad scientist material, the kind of thing the average sci-fi obsessed kid would adore, but not necessarily a game for the rest of the world. Such was my thinking as I downloaded the Spore Creature Creator last month. I was amazed by EA Maxis' little monster machine. It's an astoundingly versatile, user-friendly, thoroughly entertaining piece of software. For three nights solid, I was mesmerized. I tinkered endlessly with my little creations, tweaking their limbs, adding new body parts, and selecting their skin color and texture before bringing them to life in their tiny arenas. As impressed as I was by the Creature Creator's flexibility, I wasn't entirely surprised by my own fixation with its features. I'd always assumed that, as an avid gamer and sci-fi fan, I was Spore's target audience. Of course I loved it.